Our 155th single release see's newcomers Accelerator and Johnny the Boy debut on Discover Records. 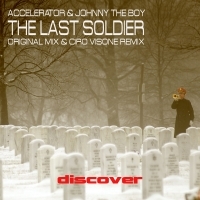 'The Last Soldier' is an acid-laden, big beat bomb. It's all kicking off with massive bass and space lasers shooting all over the place, it's a Trance bombardment. Ciro Visone is on the remix where he picks up on the acid riffs for a more tonally-calmer interpretation. 'The Last Soldier' is available now from Beatport and iTunes.